You have already heard that America has fallen behind many other countries in terms of average broadband speeds, unless you have been living under a stone the last few years. According to the Ookla Net Index, as of October 16, 2014, the United States ranked 27th with an average broadband download speed of 30.2mbps. 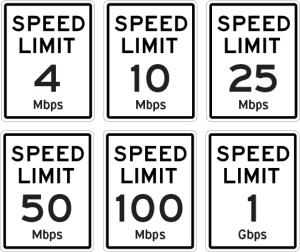 There are 15 countries with an average speed of over 40mbps. Hong Kong residents enjoy an average that is close to 100mbps. How did America lose so much ground when we practically invented the Internet and are home to Internet titans like Google, Netflix, Amazon, Facebook, and Twitter? NO COMPETITION. The 1996 Telecommunications Act — which was meant to foster competition — allowed cable companies and telecoms companies to simply divide markets and merge their way to monopoly, allowing them to charge customers higher and higher prices without the kind of investment in internet infrastructure, especially in next-generation fiber optic connections, that is ongoing in other countries. Does real broadband competition bring faster broadband speeds to communities in Ohio? In some homes around Dayton, residents have a choice of broadband with a peak speed of 45mbps from AT&T in limited areas or broadband with a peak speed of 50mbps from Time Warner Cable. Many homes may find only one choice of providers offering broadband greater than 4mbps. This is the common duopoly in most of Ohio and across the country: a choice between the incumbent telephone company (AT&T, Verizon, CenturyLink, or Frontier) and the incumbent cable company (Time Warner Cable, ComCast, Cox, or Charter). As we described in the series introduction, our communities are missing out on benefits of true broadband competition. Does slower broadband speeds put Ohio at a competitive disadvantage? The answer is yes. Referring back to the Ookla Net Index for the US, Ohio ranks 48th with an average broadband speed of just under 17.5mbps. Dayton ranked 80th in the cities listed right at the Ohio average. Referring back to the Ookla Net Index, there were three cities in the top 20 download speeds. Austin, Texas at over 68mbps, where Google Fiber’s announcement to build gigabit to their city prompted competitors like AT&T and Time Warner Cable to upgrade broadband speeds to their subscribers at no extra cost. Kansas City, Kansas at almost 65mbps, where Google FIber initiated their gigabit fiber in 2011. And Flushing, New York at just over 50mbps, where Verizon FiOS covers close to 73% of the market and competes with two cable operators. The vast majority of states saw Internet speeds accelerate in the second quarter from the quarter before: seven even saw double-digit increases in average speeds between the first two quarters of the year, according to Internet infrastructure provider Akamai. Speeds in the second quarter of the year were also universally—and often significantly—higher from the year before, according to data provided in the organization’s quarterly State of the Internet Report. In all the results, Ohio was in the group of states shaded with the lowest speeds and smallest increases. Real broadband competition with fiber to the home will bring faster broadband speeds to homes in Ohio. Extra Mile Fiber wants to bring those faster broadband speeds through fiber to Dayton homes. I’ve been surprised year after year how long the ISP oligopoly has been allowed by Americans to continue, with each passing year, there are more and more users with higher and higher bandwidth needs, yet few seem to have questioned or expressed dissatisfaction with service offered until very recently. It’s great to finally see companies making strides to dethrone the current broadband giants, TWC/Comcast and AT&T have reigned for far too long. Really looking forward to the revolution!